Over the past few years hammocks have started to grow in popularity as a method of slumber in the backyard, at music festivals, and at campsites too. Because they’re so easy to set up, more and more day hikers and thru hikers have begun rigging them up off the trail to take a break during their travels. I too have been known to break out a hammock around sundown to take my mind – and feet – off of things for a while. But this whole hammock sabbatical scene has grown beyond relaxation in hammocks. It has become a community of people looking to cut loose and celebrate with their fellow wanderers. 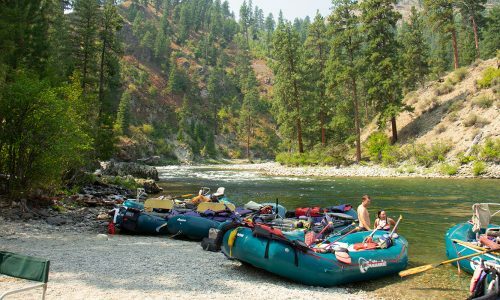 Whether you’re the first one to post up a hammock, or happen upon some other folks already indulging , these retreats tend to grow into mobile forest festivals of their own, complete with craft beer, music, and good times. And of course, all are welcome to join in on the fun and laughter. That said, whether you’re inclined to go solo or fall in with one of these nomadic hammock troops there are a few crucial pieces of gear you should plan on bringing along with you in order to truly experience the experience. I recently spent some time with a local hammock tribe and not only observed their rituals but partook in some of the revelry myself. Here are a few key items I took with me in order to properly indulge. At the core, this whole thing is about the hammock, so it’s mission critical that you bring something that you can kick back and relax in. My hammock of choice is the ENO DoubleNest as it’s big, roomy, and brightly colored. What’s more, it’s very tree friendly and super easy to set up with the included Atlas Straps. For those folks looking to use their hammock as their main dwelling for the long haul, consider the DoubleNest OneLink Sleep System, which comes complete with bug net, rain tarp, and ground stakes. With all of the technical day packs on the market, it seems kind of crazy to look to a car rack manufacturer for your next means of gear hauling, but the Thule Stir 35 provides the user with easy access and a lot of features usually only found in a high-volume pack. This top loader without a top has a volume of 2135 cu. in, is easy to adjust for multiple torso lengths, and utilizes Thule’s StormGuard system which employs the waterproof bottom of the pack and an included removable rain cover. 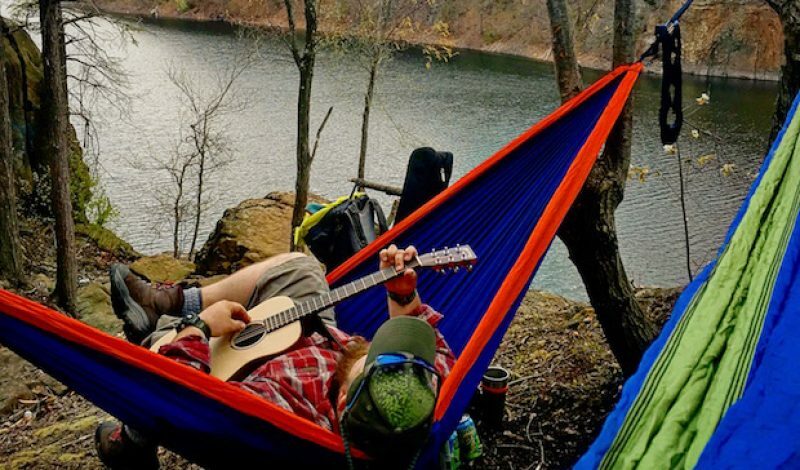 If you were to show up at a keg party with a guitar or harmonica, you’ll probably get a beer dumped over your head only to go home alone – but at an off-trail hammock social you’ll fit right in. The Martin Guitars LX1 Little Martin is much smaller than your standard acoustic guitar, but is surprisingly full of sound. Designed for travel, the LX1 is perfect for noodling or leading a homegrown concert complete with complex, elongated jams, and double encore in the outdoors. What’s more, the LX1 is lightweight and comes complete with a nylon gig bag with shoulder straps making it easy to haul about. For more than a century harmonicas have been keeping nomads and hermits company by a late night fire. Depending on how you play, they also might be more effective than a bear bell in pinch, but I digress. The Hohner Blues Harp is top notch for your outdoor interludes as it has a wood core that is not only easy going on your mouth, but will also bend the notes a lot better than your average plastic core harmonica. I’ve been playing for over twenty years and find it to be the quintessential instrument for jumping into a jam unannounced. Soak it in your favorite craft brewski before you go and get down to insure you don’t get hung up on those bends. The Beer – The Weirder the Better! Good beer will grant you admission to almost anything these days as there has never been such a variety and such an attention to detail in its craftsmanship as there is right now. In short; craft beer is wicked popular at the moment. Though I won’t be so brazen to tell you which beer I think you should take with you out there, I’ll recommend you stick to Session IPA’s and Gose style beers. Both are lightweight, low octane, and will do more to refresh you than knock you out. Do Mother Nature a solid and stick to the stuff that comes in cans, it’s better for the environment and it won’t shatter on the trail. There you have it – a quick compilation of needful things that will allow you to get the most out of this woodland past time that is quickly growing in popularity. Though mid-day is the most common time to come up on a makeshift hammock camp of the caliber I’ve been referring to, the diehards come back for a second session around sunset, which is when things can get really magical. Even if you’re not ready to go all in and commit to something like this, do yourself a favor and at least experience it on your own or with a friend. There’s no therapy or drug as powerful as the outdoors – a spontaneous hammock holiday only amplifies that power. My hammock is purple and orange, and I’m usually clad in flannel. If you see me out there, come on up and have a moment in serenity. See you out there!